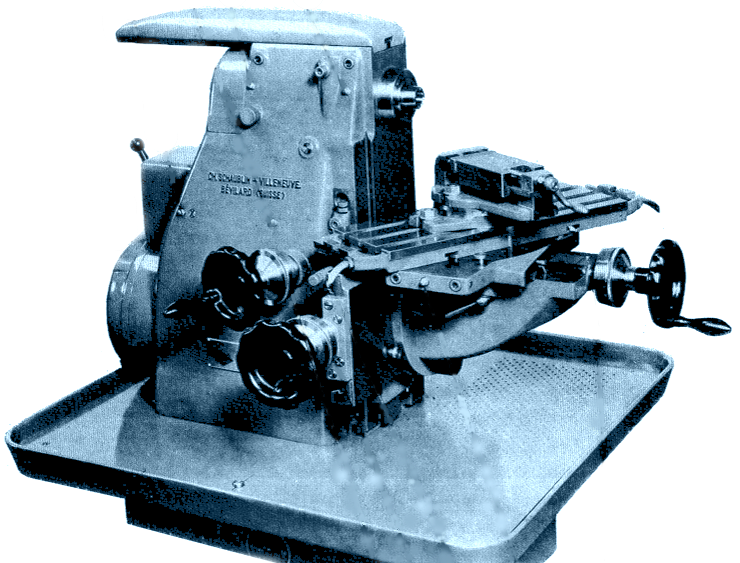 Occupying less space than a 50cm cube and weighing just 40kg, the model 11 was the smallest capacity milling machine in the Schaublin range. Designed around the 65 and 70 lathes the SV11 was aimed at the same market as the Aciera F12 and later the F1. However, the Aciera machines were far more versatile and consequently quickly gained an excellent reputation and sold in large numbers. 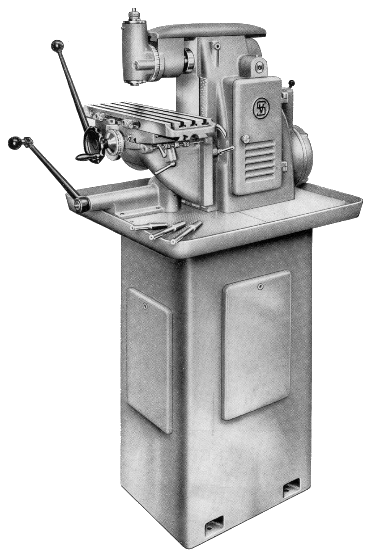 Post-WW2 the SV11 was promptly dropped from the Schaublin manufacturing programme and consequently it is extremely rare – I only know of one machine in the UK. In constructional terms the SV11 bore more than a passing resemblance to the SV12, and in many respects the SV11 mirrored the SV12 in the same way that the SV65/70 and SV90/102 mirrored each other. While the SV12 was marketed as a natural companion to the 90 or the 102 lathe, the SV11 was the natural bed-fellow of the 65 or 70 lathe. To this end Schaublin 65/70 bed profiles were used for the table and the headstock slide allowing headstocks, tailstocks and other equipment from the 65 or 70 to be used on the SV11. Table travels were just 90mm for the longitudinal slide (x), 70mm for the headstock slide (y) and 80mm vertically (z). The headstock could be positioned anywhere along the x slide giving a further 130mm of flexibility. In horizontal mode, the distance between the table and spindle was 20mm minimum and 100mm maximum. Both the x and y axes could be controlled by either a screw or lever while the vertical was screw only. Powered feeds were not offered. 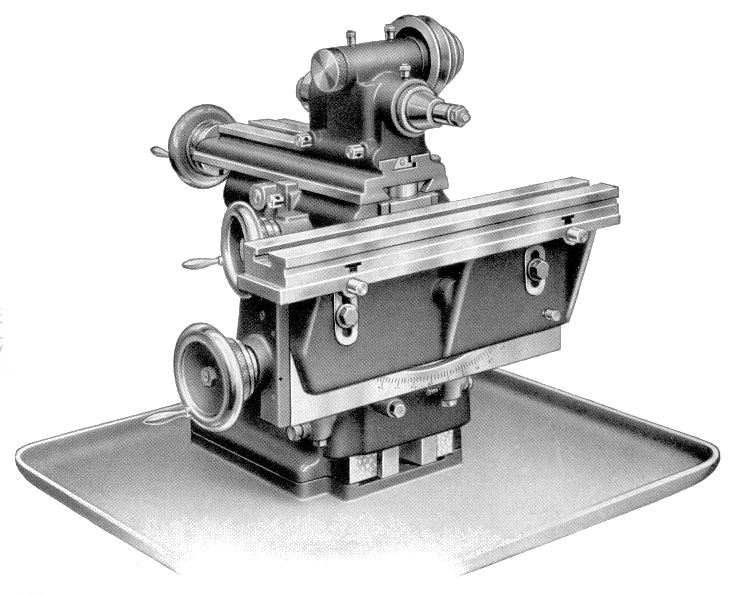 The very compact round belt driven headstock had some similarities to the milling attachment spindle for the Schaublin 102 since it not only employed W12 collets but used an identical pulley and a pair of crossed helical gears to provide a suitable reduction in speed for the milling cutters of the era. A right angled bracket took the headstock from horizontal to vertical. On request the headstock could be ordered with a W10 spindle where the machine was to accompany an SV65. The Schaublin 11A and 11B machines bear little resemblance to their namesake – why Schaublin named them so is a mystery. 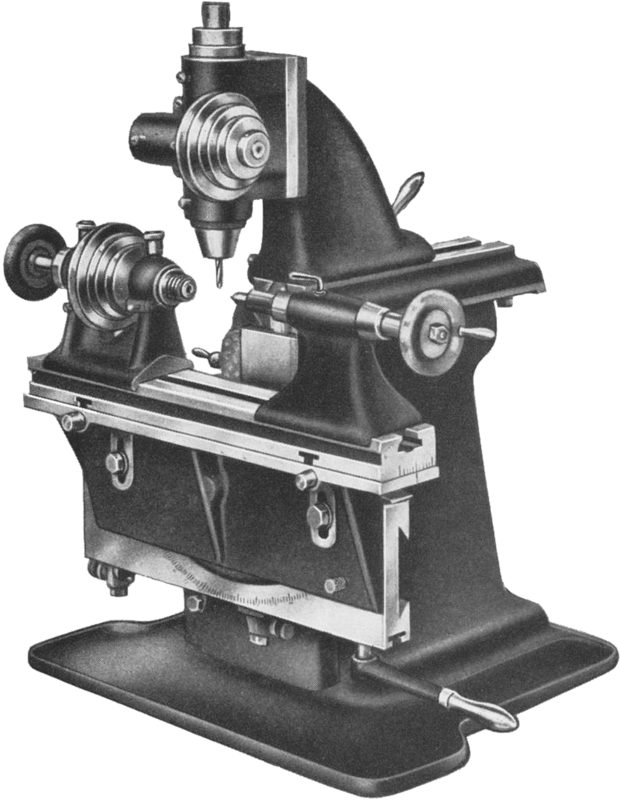 More robust and modern in design than the model 11, the 11A was something between a “continental pattern” mill like the 11 and a knee-type mill such as the Mikron F75. The vertical slide was carried on the frame as normal and the longitudinal slide was mounted vertically in the continental style. However, the headstock was part of the frame and cross travel was provided by a knee-type casting carrying the y axis and table. The table could be swiveled in the horizontal plane while the whole knee pivoted on the front face of the longitudinal slide allowing the table to be tipped out of the horizontal in either direction. The horizontal spindle was carried on a micro-adjustable single row roller at the front with ball races at the rear. The spindle taper was no 2 Morse with adapter sleeves and drawbars for W10 or W12 collets. A two speed motor neatly mounted in the bottom of the machine’s frame drove a countershaft via a V-belt and from there another belt took power to the spindle. Four grooves on the motor pulley and countershaft and two steps on the countershaft and spindle gave sixteen speeds ranging from 235 to 5100. An overarm with prismatic section provided support to horizontal arbors and doubled-up in mounting the swiveling 2MT fixed quill vertical head. The 11B was a machine suited to production work. Although built around a similar frame to the 11A, the 11B differed in having a fixed knee with conventional horizontal slide table. Longitudinal (x) and vertical (y) feeds were lever operated. I have very little literature relating to these interesting little machines and would welcome any comments and information from knowledgeable readers.